Story telling is an art, and sometimes you can paint it via words, other times through food, and sometimes merely through a vision. But the most memorable of stories are those that span oceans, and at least for me, involve at least an ounce of food in their progression! The Ancient Greek Gods have had a knack for storytelling through mythology, affecting philosophy and culture and even mathematics worldwide. And having traveled to Greece multiple times, I have found the salty kisses of the clear ocean to be rejuvenating, as well as the discovery element of wandering through unexpected cities outside of the cosmopolitans and tanned bodice flocked islands. 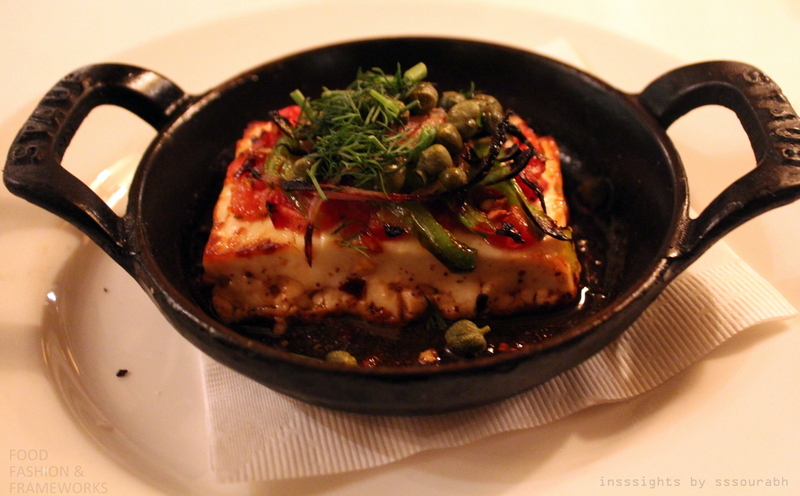 Ironically, in a similar city bursting with hidden streets and secrets and a culinary foothold in every food critic’s mind, San Francisco, I found a Greek escape that lived up to its name. Literally. 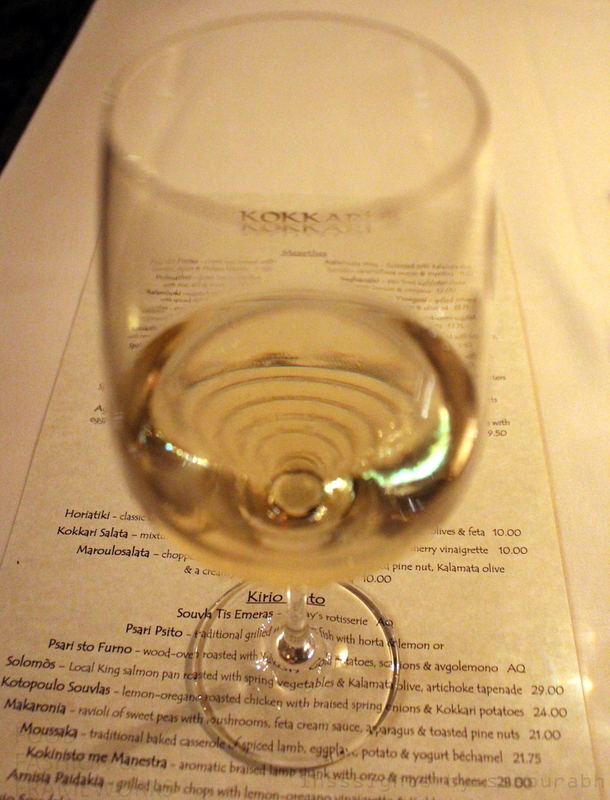 Kokkari Estiatorio was named after a small fishing village on Samos in the Aegean Sea. Which made a glinting and gold promise: cuisine for the Gods. Legend had it that this is where son of Poseidon, Orion, fell in love and prepared elaborate banquets for her too to win her heart. Love stories involving food truly are the best stories, and this one made a promise that I would fall in love with my food. With Chef Erik Cosselmon and Manuel Vera in the kitchen, the Greek classics were beautifully created, with a touch of difference and Bay Area adaptation present in several dishes. Being a fan of authentic Greek cuisine, I went for classic dishes, quite unlike my usual whimsy, for I wanted to inhale this love story at the best. 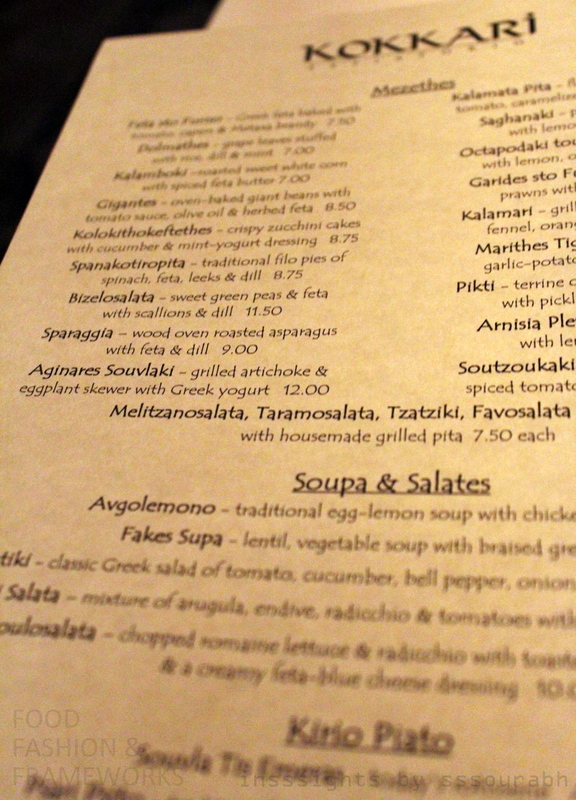 Kokkari boasted of several different dining areas, each with a Greek name. One had to walk through the front room, Saloni, featuring a fireplace and dramatically lit bar with upholstered chairs and maroon carpets. 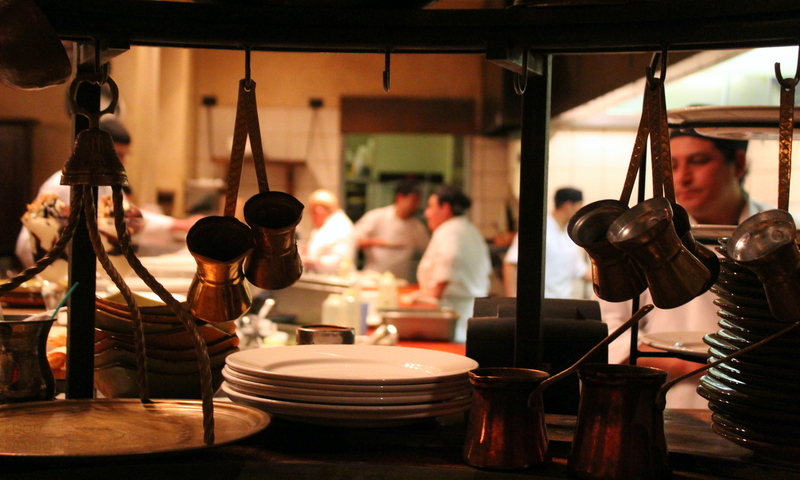 I was taken to the back, near the kitchen to my favorite room, the Kouzina, known as the kitchen dining area. High ceilings with huge windows that looked onto the street made it apt for people watching. 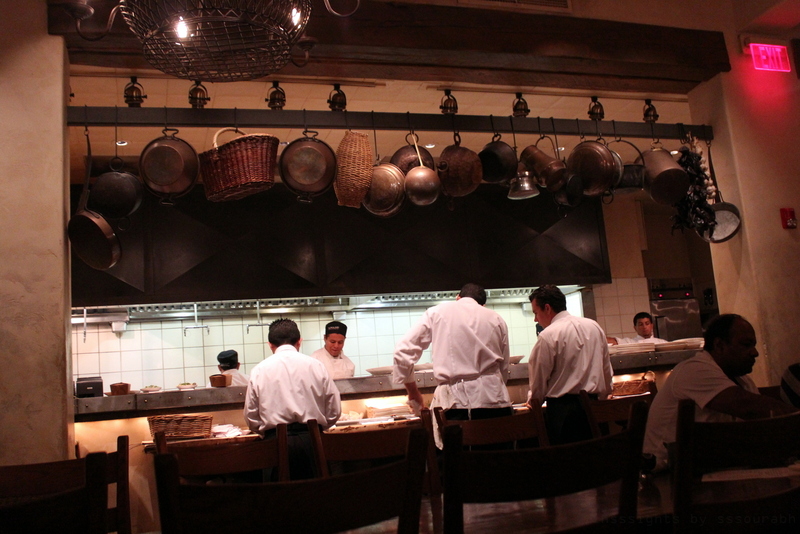 However, I was more into seeing the chefs cooking in the open kitchen with its bright fiery lights, which is truly where all the light came from, akin to a similarly staged Los Angeles outpost called Cleo. 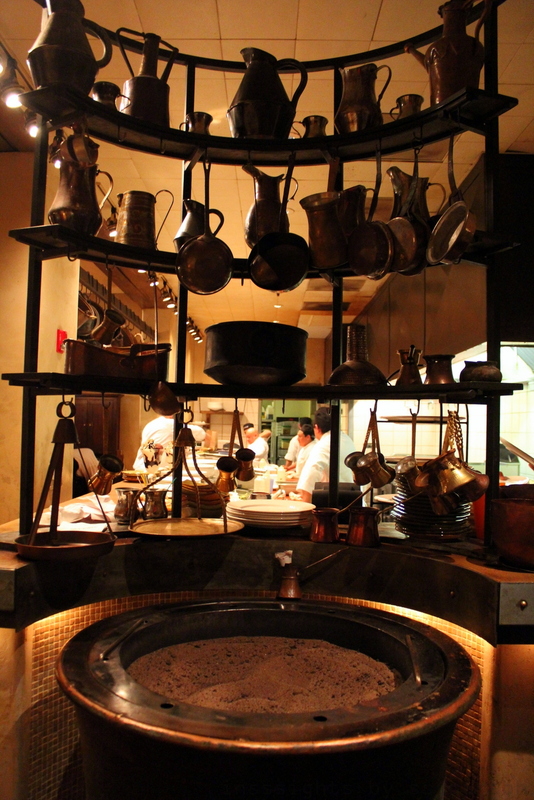 The kitchen was outlined with brass and copper kitchenware, with a large sand filled stove at the entrance, giving it an earthy, rustic feel. Designed by the award-winning architect Howard Backen, I found that the honorable respect given to ambiance already won half the battle with this food critic. Hospitality at its forte, similar to my trips to Greece, I found a surprising adaptation to my vegetarian diet. 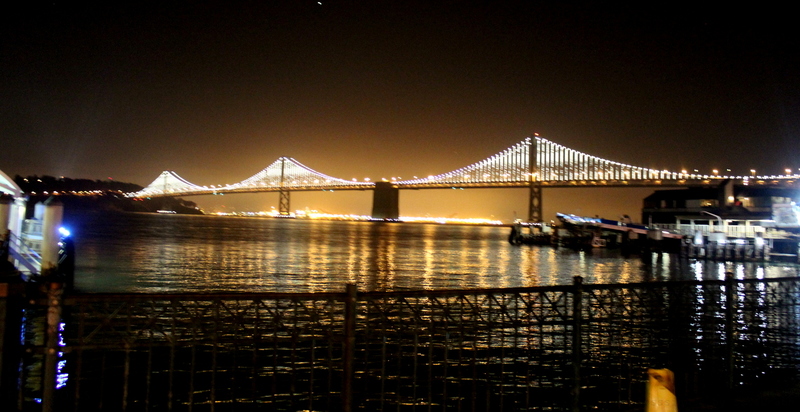 Something that made San Francisco a favorite culinary city for health enthusiasts like myself. 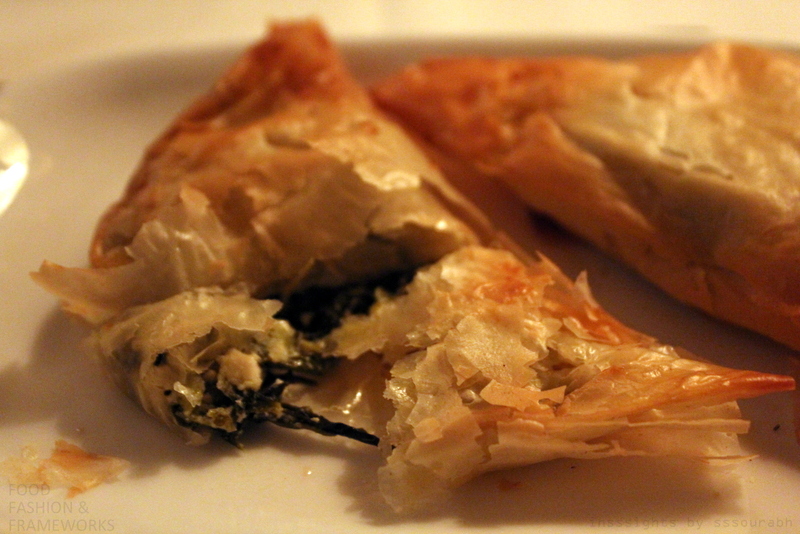 I started with spanakotiropita, traditional filo pies of spinach, feta, leeks and dill. With crispy layers of filo akin to a baklava infatuation of the past, I found the sour combination of leeks with salty feta to be alluring. Only mildly greasy, I gobbled the pies up owing to the well cooked and delectable spinach. 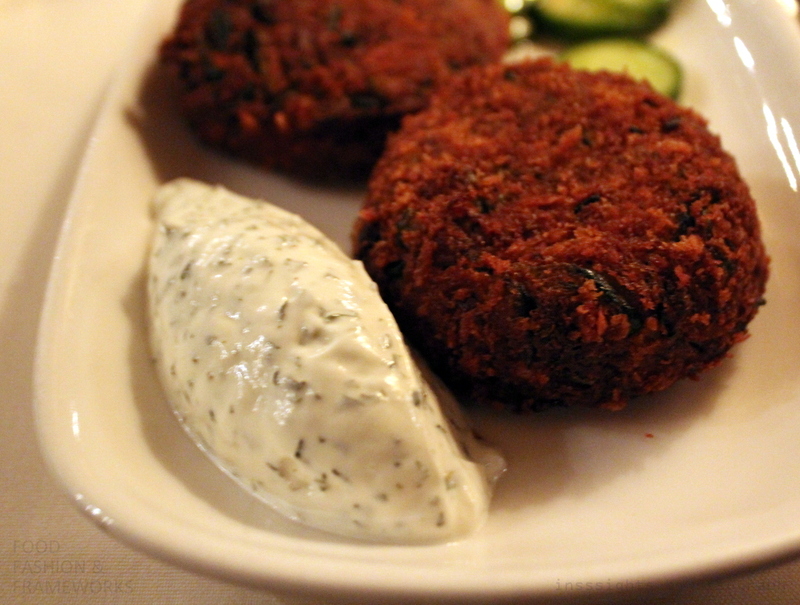 Next up were the Kolokithokeftehes: crispy and browned zucchini cakes with a cucumber and mint-yoghurt dressing. 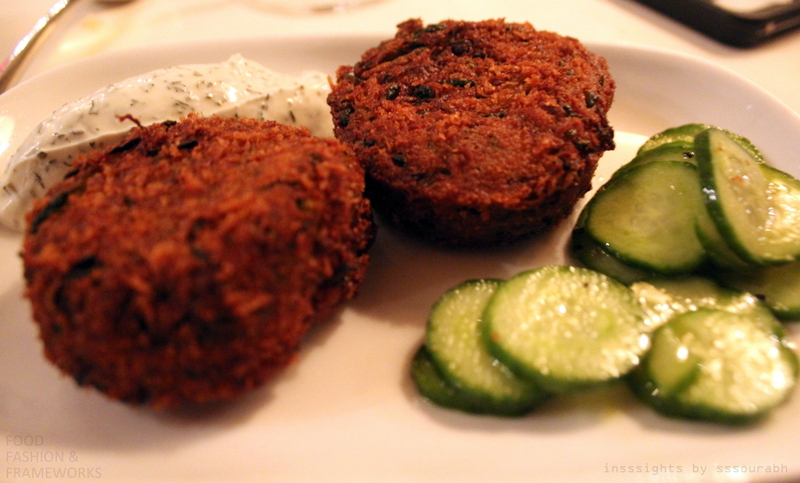 Almost Indian in their crispy cutlet shapes and flavors, the combination with fresh Greek yoghurt made this Mediterranean dish highly refreshing. With slivers of warm zucchini in every bright, they tasted healthy with a sumptuous crunch, marrying well with the bright and minty yoghurt. 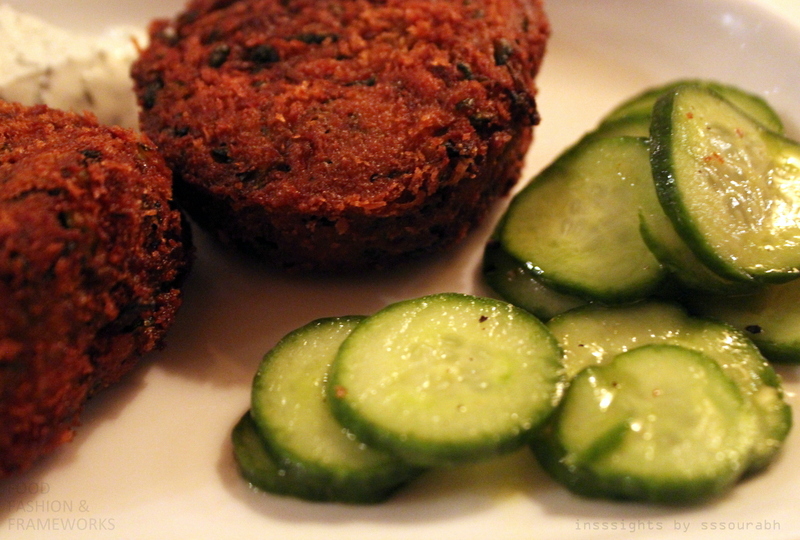 The pickled cucumbers were a fresh accomplice, and even added a dimension of color to the plate. In my love story, cheese played a pivotal role. 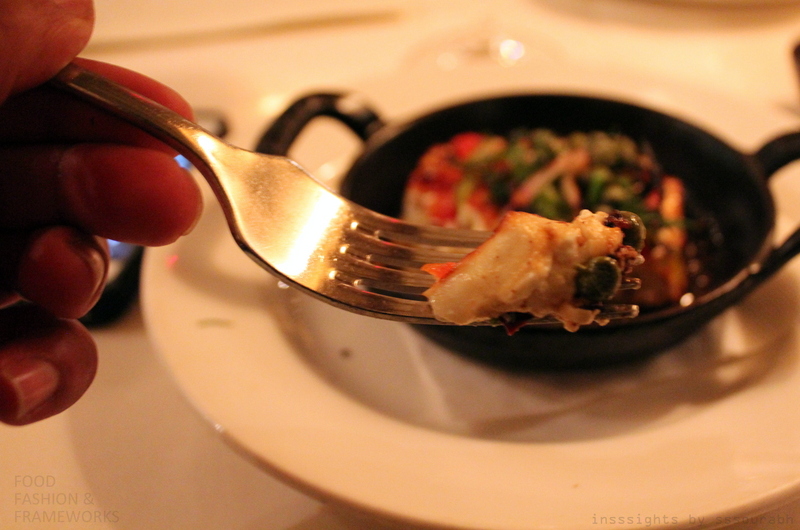 I was thrilled to find Saghanaki in elevated and almost illusionary tastes: fried kefalotiri cheese, still flaming, tasting partway between paneer in texture and goat cheese in tangy salty taste, with lemon and oregano, all served in a traditional burnt black iron skillet. 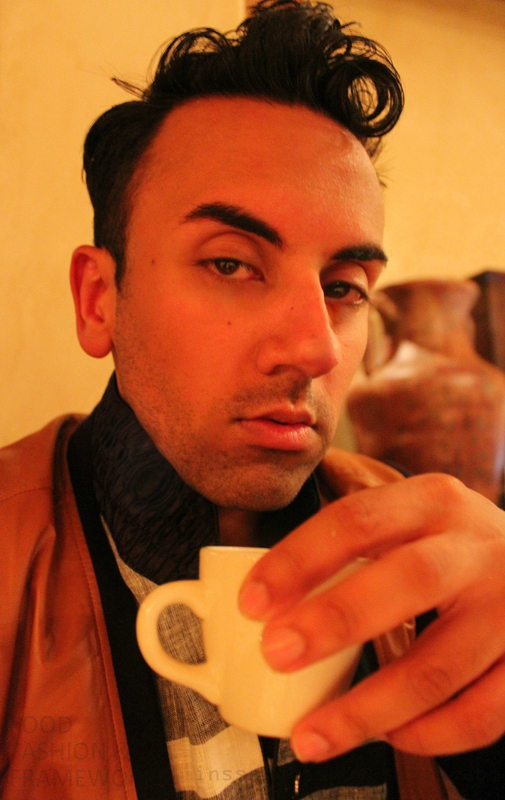 Heating up my face as I reached over to smell it, I ignored the heat (for what’s a love story without heat! ), and inhaled the herbacious aroma. The lemon cut the fried-ness to make this one gobbleworthy meal. Especially when topped with greens, peas and beans, all brimming of the succulent flambe. 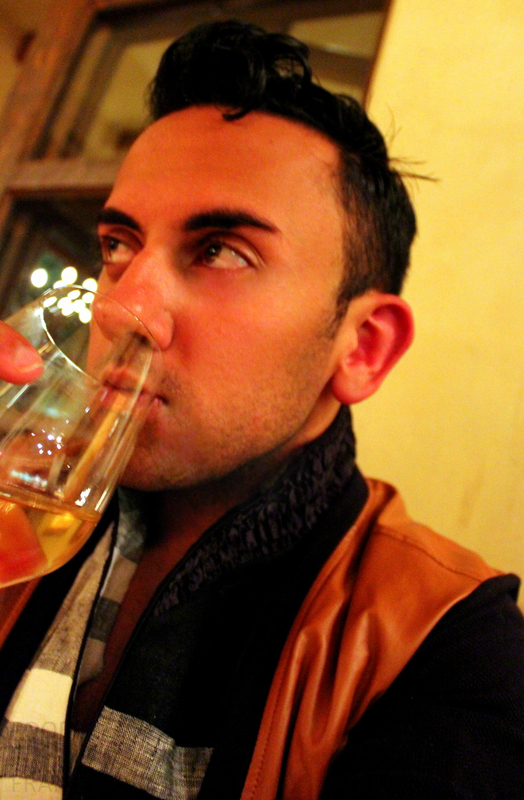 I got house white wine at this point to cleanse my palette to prepare for a main course and dessert. For who else orders more to digest more? For a main course I went semi Italian, but not too much; it was still somewhat Mediterranean right? A crispy ravioli with spiced brown butter, toasted almonds, English peas and even more feta cheese. 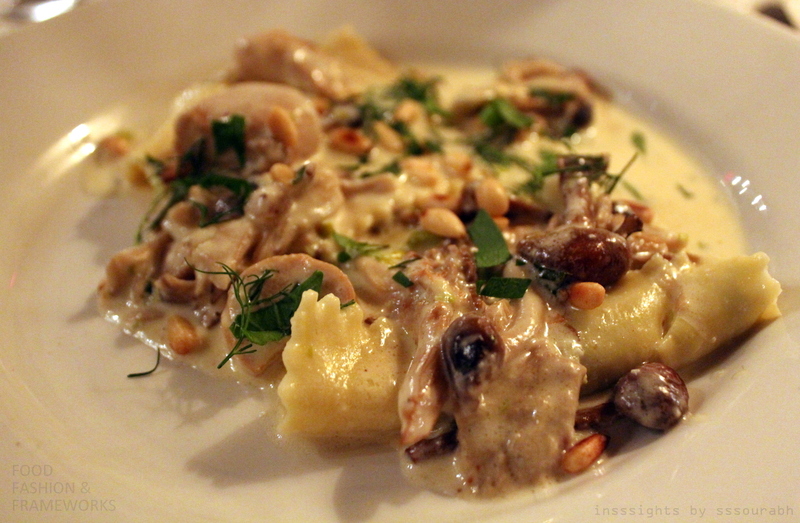 Topped with pine nuts, a few slivers of mushroom and herbs, it was a slightly more Italian route than I would have liked from a Greek staple. 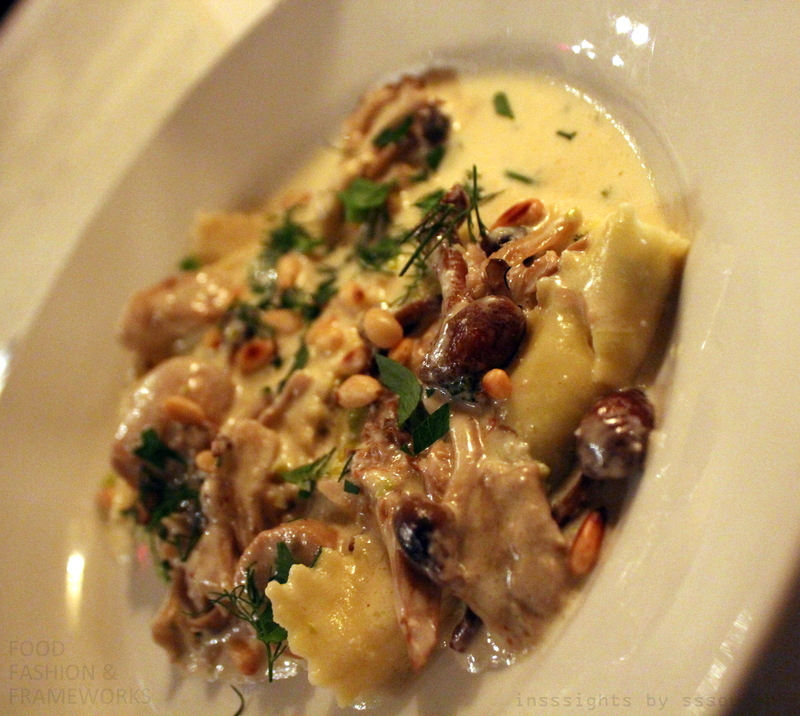 But the nutty-ness and feta wove the sequence from previous courses. And who doesn’t like brown butter? A hearty, and immensely filling dish. 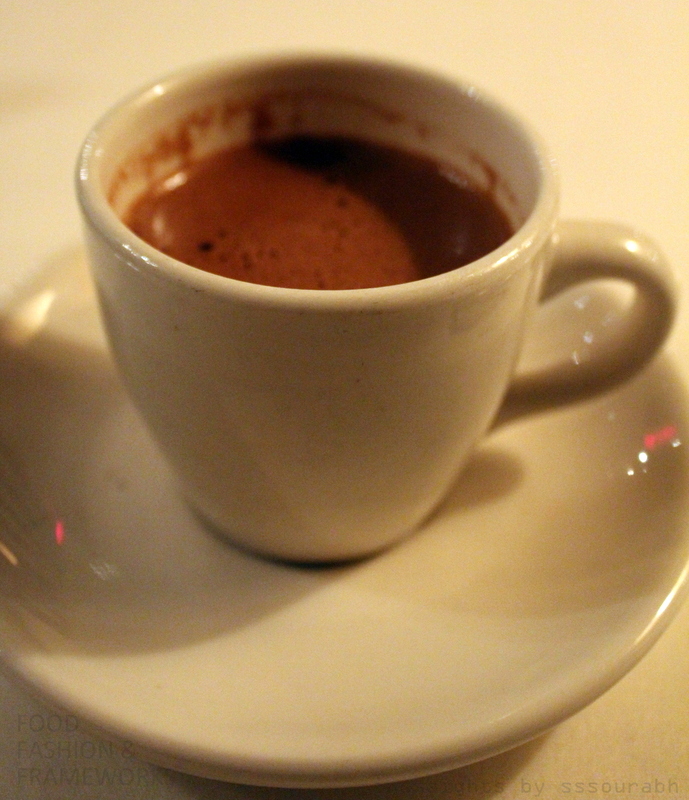 To digest further, I got the traditional Greek coffee: stone-ground coffee heated over hot sand, with some sand sediments at the bottom of the espresso-like cup. Thick and almost hot chocolate like in texture, it was the jolt of caffeine that I needed to get through my meal. I got it metrio, meaning medium sweet, despite knowing that I had dessert coming! 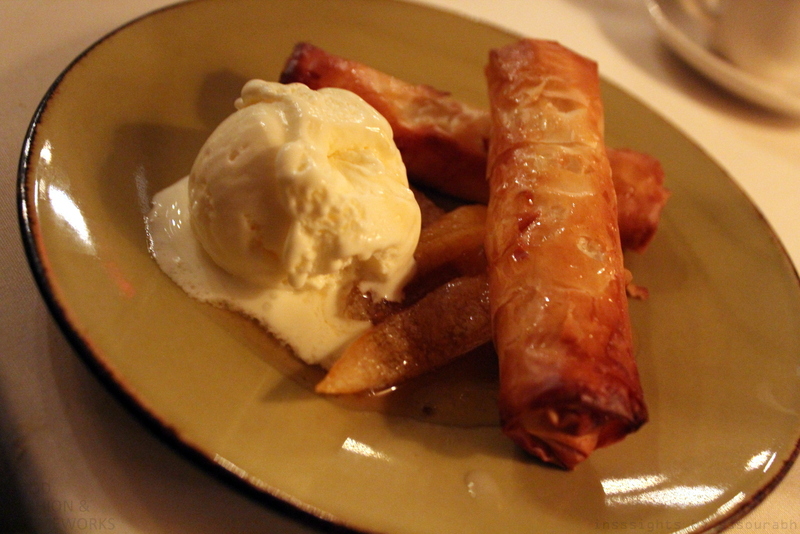 And as expected, dessert was a baklava – my Middle Eastern song of love, which I always get when I’m touching the Mediterranean cities from oceans far, far away: case in point, Salt Lake City and Rotterdam! 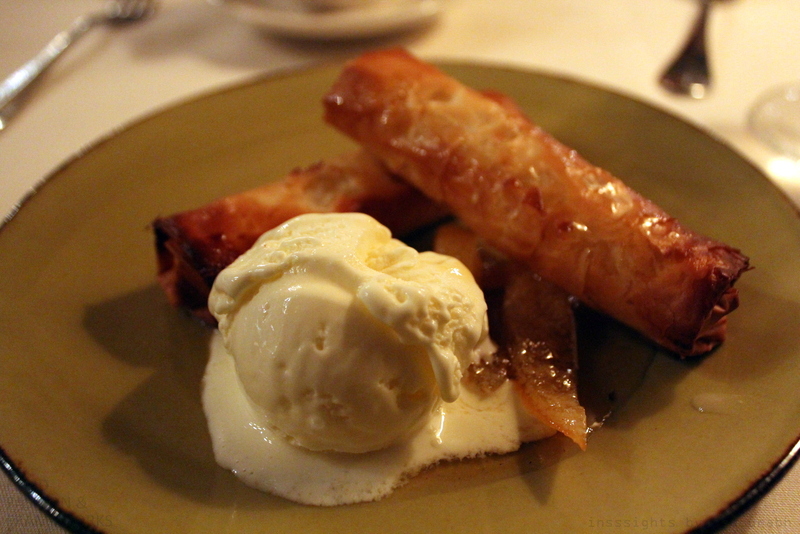 This was a traditional walnut and honey baklava with vanilla praline ice cream. Almost as if circling my meal to completion, the flaky filo of the onset was back, this time with sumptuous notes of honey, nut, and granules of cinnamon and nutmeg which I could feel as I bit into it. The candied oranges as accompaniments were a syrupy, tangy, sticky and tooth-gluing goodness that I could snack on all day. They also balanced the honey and nutty sweetness well. I could have done with less of the melting ice cream as it took away from my heated indulgence, but it was a cleverly under-sweetened vanilla and praline combination. One that I bit into, lusting for more, and thankfully even got more to take home courtesy of the sous chef! Content in my mind, heart and stomach, I left this rustic, ethereal ambiance for heading back into the Pacific. With a taste of the Mediterranean that was as unforgettable as its love story.